Under what circumstances would you terminate your cable subscription? 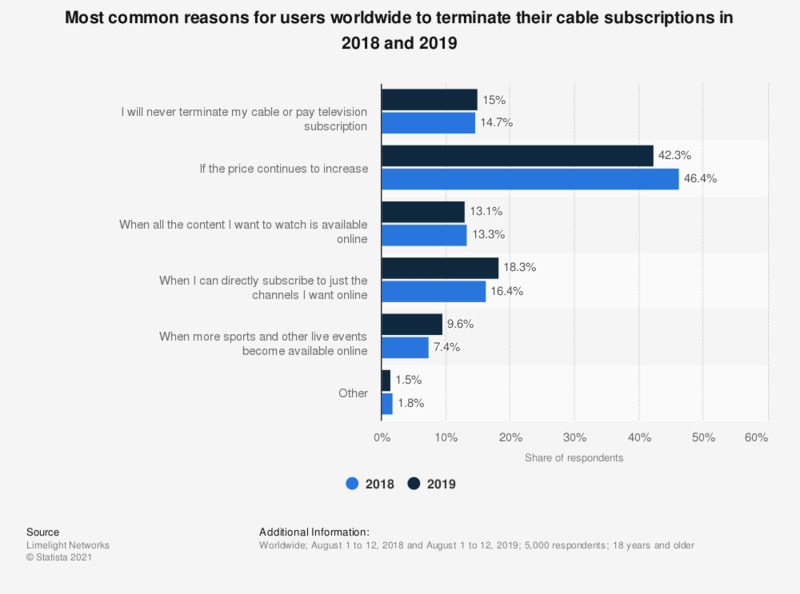 This statistic shows the responses to a survey about reasons for terminating a cable television subscription according to global online users as of August 2018. According to the source, 46.4 percent of respondents would terminate their cable or pay television subscription if the provider continued to increase the price. This survey was fielded by a third-party company with access to consumer panels in France, Germany, India, Italy, Japan, Philippines, Singapore, South Korea, the UK and the United States. 500 responses were collected from each country for a total of 5,000 global responses. Original question: Which of the following is most likely to make you terminate your cable or satellite television subscription? How likely are you to cancel your pay TV subscription?